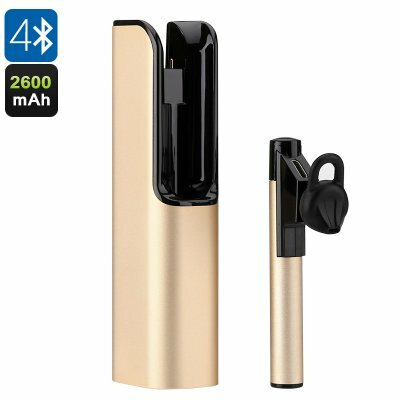 Successfully Added Wireless Bluetooth Headset - Built-in Mic, Hands Free Phone Calls, 10m Range, Noise Cancellation, 2600mAh Power Bank (Gold) to your Shopping Cart. No matter where you’re at, with this wireless Bluetooth headset you’ll always be able to listen to your favorite tracks. Simply pair this wireless headset with your smartphone, tablet, or laptop – and you’ll be all set to sit back and enjoy your music in stunning audiophile-grade quality. Supporting Bluetooth 4.1, this accessory features stable and lightning fast data transmission speeds – providing the best audio standards imaginable without experiencing any interruptions or lag. 10m Bluetooth range furthermore brings along great mobility, allowing you to move around while listening to those all time classics without affecting the audio quality of your songs. Featuring a stylish and lightweight design, this Bluetooth headset can be worn comfortably at any time of the day. Its universal fit ear plug features an in-ear style design, ensuring a stable fit to anybody’s ear. Additionally, this wireless headset comes with its own miniature 2600mAh power bank that, itself, is also extremely portable. With access to this powerful portable battery, you’ll be able to recharge your headset numerous times – ensuring that you’ll never run out of juice again while listening to all those great songs in your smartphone library. Besides letting you listen to all those songs you love most, this Bluetooth headset furthermore features a built-in mic. Its smart design allows you to easily accept or reject incoming phone calls with the press of a button – letting you engage in hands-free calls whenever you want. Equipped with the latest echo and noise cancellation technology, this wireless headset lets you enjoy all your songs without getting interrupted by outside sounds from your environment. Great for at home, at school, or while on the move – with this wireless Bluetooth headset you’ll always be able to enjoy those all time classics and engage in hands-free phone calls no matter where you’re at.